Churches in developed countries continue to drift away from their spiritual moorings at breakneck speed. The shameful has become acceptable. 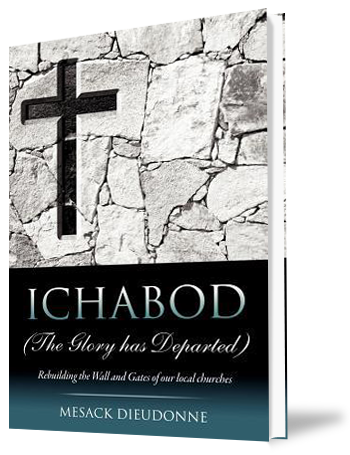 In the pages of Ichabod: The Glory Has Departed, Mesack Dieudonne presents the concept of spiritual walls and gates and illustrates why so many churches lie in ruins, allowing the enemy to flood in. Ten spiritual gates need to be in place including the one most important, the Gate of the Supremacy of Jesus Christ, in order for His presence-the Wall-to return. Is there hope? Only if we become "repairers of the breach" (Isaiah 58:12). Mesack Dieudonne is a Bible teacher, speaker, evangelist, author, and president of Let Us Take a Stand for God Ministry (LTSG) who works tirelessly to see Christian evangelical leaders come together for a common purpose. He preaches the cross of Jesus Christ, wins souls for the kingdom of Light, and mentors young people who have been called to be evangelists.